One BIG ring, or more smaller pieces?? It is DH and I's 10th wedding anniversary soon and he has given me a budget of £3500 - £4000 to spend! Pros/cons of A; As DH Tells me, the only piece of jewellery I have ever wished for is a really nice full eternity. But I am a SAHM and don't live a flash lifestyle. Generally people I mix with a understated and don't wear much jewellery and I hate drawing attention to myself. Bigger diamonds don't seem as common in the UK as USA. 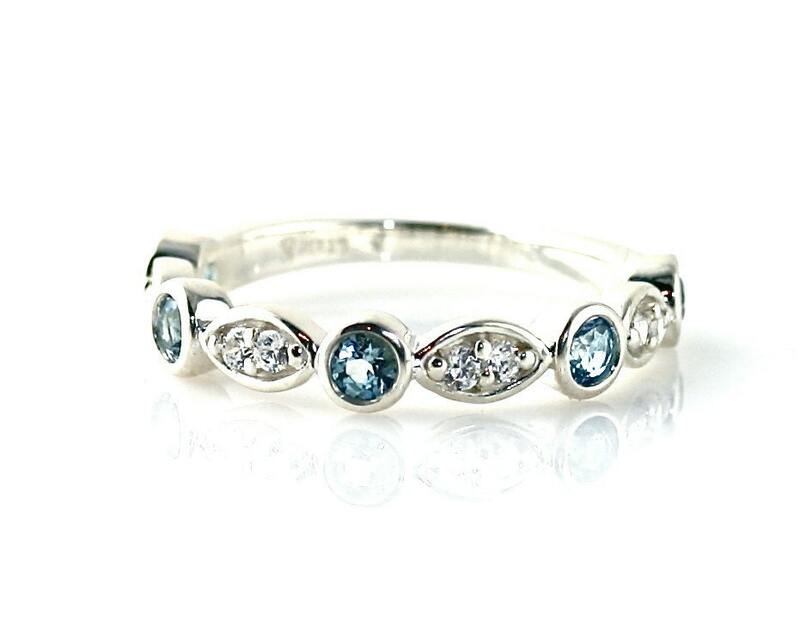 Pros/Cons of B; I have the matching WG eternity ring and I like to stack so they would look good together I think. I will be getting a RG cuff and this is a good way of mixing RG in. I don't have any diamond studs and I think they would be great for everyday, the bracelet too could be worn everyday as it is understated. I love Aquamarine, plus it's my birthstone and I don't have it in a ring, only a bracelet (though I do favour full over half eternity's generally). It does seem to be a lot of dis-jointed items, though I could wear them all everyday. So WWYD? I have a very small jewellery collection at the moment, and I do like to switch my rings and bracelets around quite a bit. I would choose B. From the sounds of it, you probably wouldn't feel comfortable wearing the flashy eternity band all the time, while you would wear ALL of your B choices daily. My Grandmother used to say, "buy ONE thing, but make it good!" Option A - it is gorgeous. It seems like this option is more suitable for your lifestyle and won't draw as much uncomfortable attention. Diamond studs are perfect for wearing everyday without going over the top and can be dressed up or down. The combo of the items seem to really help diversify your jewelry box. I would normally say option A go big! For a 10 year anniversary, I would go big on a single item. Option A is a good choice. Moreover it's the big items that are really worth as heirloom pieces. Thanks faintly, that is my opinion too, will get lots of mileage from each of the pieces. That is very true! Apart from my beautiful e ring (which I am scared to wear too often as it is 80 odd years old) I have no stand out piece of jewellery. Though I do have a RG cuff on order which I hope will be stunning. Thanks, that is DH's opinion too! Again, very good points! Thank you. Hahaha, so your vote is for both! Heirloom is a very good point. I love the idea of passing things down to DD and maybe a future DIL as well as my niece. Though eternity rings can't be sized and there's no saying they will be the same ring size as me. I guess the stones could just be re-set. I'm not sure anyone else can really help with this decision. If the big piece isn't suitable for your lifestyle or if you would be uncomfortable wearing it, then it will just sit in a jewelry box making you feel bad. That's no way to spend good money. If the other pieces will be worn more often, then those are probably the better choice for you. On the other hand, I don't know that the eternity band is necessarily too blingy, especially if it is worn by itself. Sometimes rings aren't as noticeable to other people as we think they are, and an eternity band is a great way to wear a lot of carat weight without it looking as ostentatious as one very large stone. It all comes down to what you really, truly want, and not what other people think. Don't get what other people think you should, and don't let what other people wear or don't wear be your barometer of what is right for you. You only have one 10 year anniversary! I think both options include gorgeous pieces but the ones in B. do seem to fit better with your lifestyle and beautiful as the ring in A. is I can imagine you probably won't get to wear it that often. I have a diamond full eternity ring in platinum which was passed down to me from my grandmother and stunning as it is I am too scared to wear it often both because of what other people might think (bigger diamonds are not as common here in the UK like you say and I don't want people to think I am being ostentatious) and I also don't want to risk anything happening to it. One big thing!! Over the years, I amassed quite a collection of a variety of little things. Little things, though, do not make my heart go pitter-pat. I sold all of those things and am saving the money to put toward my next "big thing."